Size: 6H x 4.75Dia. The Gold and Beautiful - Gold Cheveron Hurricanes with Gold Braided Genuine Leather Handle. By Two's Company Fine Decorative Home Accents and Gifts. Size: 8H x 4.75Dia. The Gold and Beautiful - Gold Cheveron Hurricane with Gold Braided Genuine Leather Handle. By Two's Company Fine Decorative Home Accents and Gifts. Size: 10H x 4.75Dia. The Gold and Beautiful - Gold Chevron Hurricane with Gold Braided Genuine Leather Handle. By Two's Company Fine Decorative Home Accents and Gifts. Set of 3 Sizes: 6H, 8H and 10H x 4.75Dia. 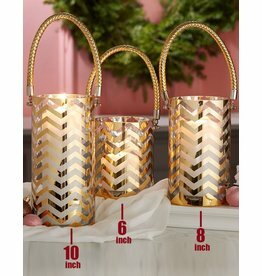 The Gold and Beautiful Set of 3 Gold Chevron Hurricanes with Gold Braided Genuine Leather Handle. 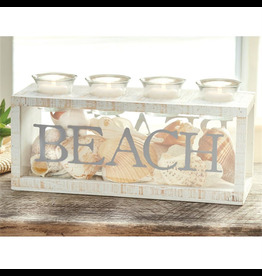 By Two's Company Fine Decorative Home Accents and Gifts. Cranberry Duet Candle Candle Crown Pairs. Size: Two Pack of 10 Inch tapers. 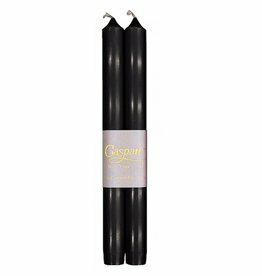 Candles and Tapers Collection. 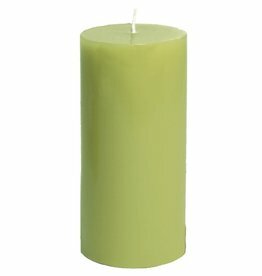 These through-colored or metallic candles are smokeless and drip-less. Tapered to fit standard candlesticks. Approximate burn time 12 to 14 hours.